Francis Livingston, Canyon Journey (Canyon de Chelly), Oil on Panel, 30" x 30"
Some 30 years ago Francis Livingston found his niche painting Western scenes and Southwest landscapes, and since then he hasn’t strayed much from his path. He keeps energized by interspersing paintings of boardwalks and urban scenes. Despite differing subject matter, viewers may catch a crossover of colors between genres. 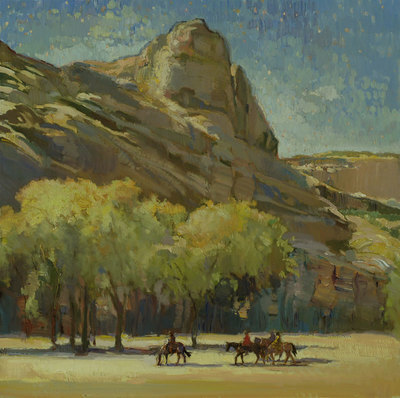 Medicine Man Gallery in Santa Fe, N.M., will exhibit up to 25 Livingston’s new Western paintings and Southwestern landscapes beginning June 20 through July 7. 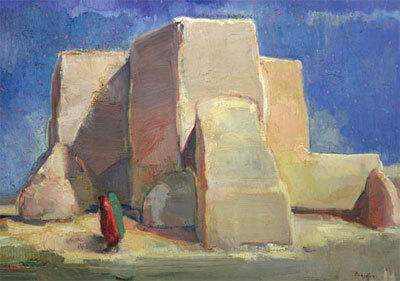 Collectors can meet Livingston during an artist’s reception Friday, June 20. Francis Livingston, Taos Sentinel, Oil on Panel, 36" x 36"
Heavily influenced by abstract artists, Livingston calls his style impressionistic and expressionistic with a touch of realism. Like his contemporaries, Livingston continues to evolve his craft. 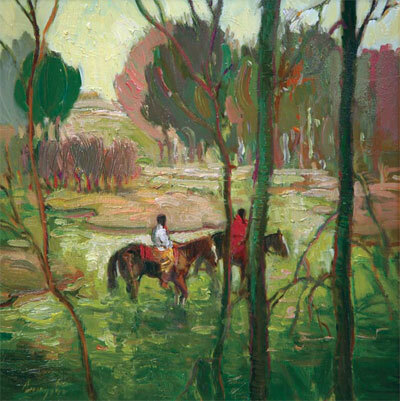 His latest paintings of figures on horseback surrounded by aspen trees and rivers continue in this vein and are richer in terms of thickness and substantial surface texture. 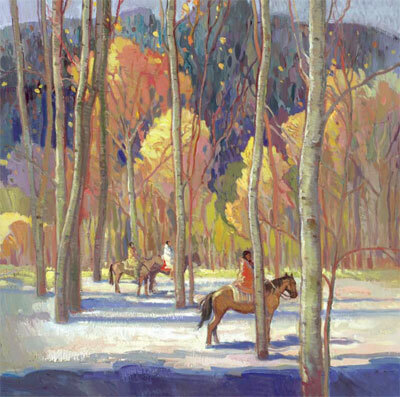 Francis Livingston, Call of Winter, Oil on Panel, 30" x 30"
Two new oils that exemplify Livingston’s tendency to incorporate figures on horseback into a quiet scene are Call of Winter and Winding River. He typically places the figures behind trees so they’re not the focal point. Over the past year, Livingston has redefined his scope and transitioned into larger works. This new show will feature several big pieces – 40 by 50 inches and 60 by 60 inches – with an expanded complexity visible to the discerning eye. An example of his latest direction resonates in Laguna Depot. 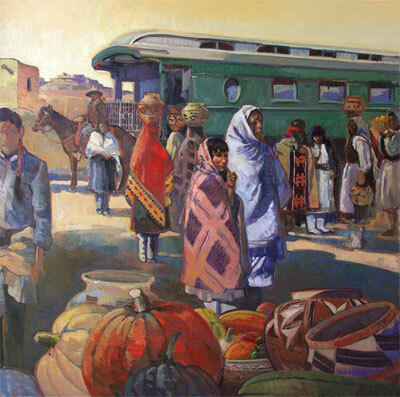 Francis Livingston, Laguna Depot, Oil on Panel, 60" x 60"
His latest piece Taos Sentinel takes this a step further with the main focus on figurative detail. Livingston pays close attention to the man’s noble facial expression and how he’s standing with the wind blowing his blanket. 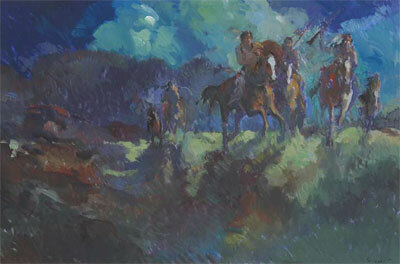 Livingston, a former renowned illustrator, admits he enjoys this progression to larger pieces. Francis Livingston, Symphony in Gold and Coral, Oil on Panel, 25" x 35"
Those who read Michael Blake’s book Dances with Wolves, of which the popular movie was based, may recognize Livingston’s work on the cover. The sequel novel, Holy Road, also features his handiwork. Commissioned by the author to portray a feeling opposite of the first book cover, which was warm and quiet, Livingston used vigorous brushwork to create a nocturnal scene brimming with energy and movement. 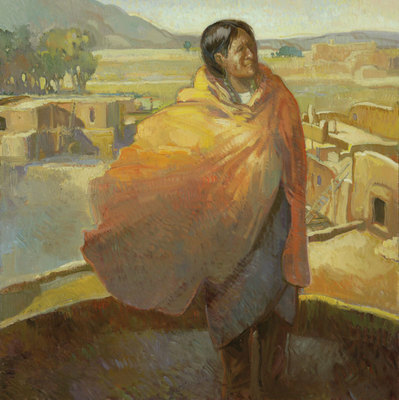 Francis Livingston, Holy Road, Oil on Board, 20" x 30"
Much of Livingston’s work is inspired by the high desert, specifically northern New Mexico and southern Colorado, as well as pueblo architecture unique to the West. His new body of work pays homage to this region’s historical assets. Livingston works mostly from photos he’s taken over the years while living in the Southwest. A native of Colorado, he supplements this with historic images found in library archives and books. It’s his deep understanding of history, the land and its people that propels him to create imagery reminiscent of the Taos Founders and other respected Western artists. Francis Livingston, Winding River, Oil on Panel, 12" x 12"
Livingston paints in oil on board, often using birch panels, because he prefers to work on a firm surface so he can create his own texture. The result gives the appearance of stretched canvas. Always drawing from the past, Livingston’s new paintings showcase a bolder move in terms of brushwork, color and composition. The majority of Livingston’s collectors comment on his varied use of color because many hues seem invented. But he assures viewers that they’re derived from reality. Over the years, he says, he has found that many of his patrons are extremely knowledgeable about art and purchase all of his genres, not just Western or boardwalks or urban scenes.